Kith is back with another dope sneaker collaboration. Ronny Fieg’s signature brand Kith has been killing the sneaker and streetwear game for the better part of a decade now. Thanks to some incredible collaborations, Kith has cemented themselves a brand you should always be watching for. 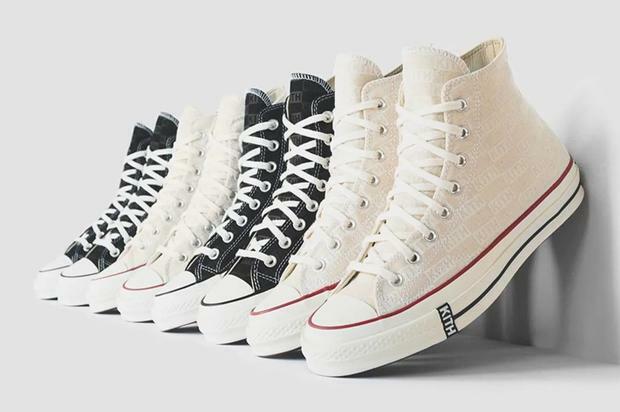 One of the sneaker brands that Kith likes to team up with is Converse. They’ve done so before on the Coca Cola collab and now, the brand is creating their own take on the classic shoe. Coming in two colorways, black and cream, these Converse Chuck Taylor high-tops will feature the Kith box logo printed all over the canvas upper. It’s a very simple design that stays true to both of the brand’s aesthetics. If you’re a fan of either Converse or Kith, these will most likely be a must-cop item especially with Spring in full swing. A price has not yet been revealed for these but if you’re looking to cop them, they’ll be available as of Friday, April 19th in-store at Kith.